Low noise, Low vibrations, Less clogging! Vibrational load do not need to be taken into account. 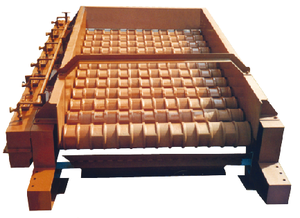 Compared to vibrating screens, the support frame can be designed lighter in weight and lower in vibrations. Low vibration reduces the powdering rate. Used in roll grizzly feeders (for coarse screening). 1) Capacity shows the case when treating raw material with apparent specific gravity 1.6t/m³. 2) Motor output (kW) includes the efficiency of reducer, chage gear and transmission part. 3) As a rule, this machine employs variable speed operation. 4) Inclination angle is standardised as 15° downward. 5) Grizzly opening shall be set to the thickness of feed material.